How new tech can improve energy development planning and wildlife conservation throughout Wyoming’s Red Desert. What is happening to the Red Desert? The Red Desert used to house a vast lake that, over millions of years, collected organic matter in a way that created rich deposits of coal-bed methane, coal, and an immense oil-shale formation. Because of this, an estimated 84 percent of the region has been leased or developed by extractive industries. One area of dramatic development, which has been permitted in waves since the 1980s, is the Continental Divide-Creston project. The newest wave of development is an additional proposed 9,000 wells in a region already pock-marked by oil and gas development. On top of this, hundreds of oil and gas related applications have been sent to BLM offices that oversee the Red Desert since 2017. With oil and gas development, along with wind and other infrastructure development, the landscape of the Red Desert is rapidly changing. Locals, government organizations, and other stakeholders are racing to understand the real effects of these changes. Fortunately, new technologies are allowing us to paint a clearer picture of what’s happening to the landscape. My colleagues and our partners are capitalizing on new platforms for satellite imagery analysis, such as Google Earth Engine, which pulls from a 5-petabyte database of satellite imagery that is updated in real time and processes images on the cloud. This imagery provides a trove of data on the spread of development in a region, and can track ongoing development in real time. 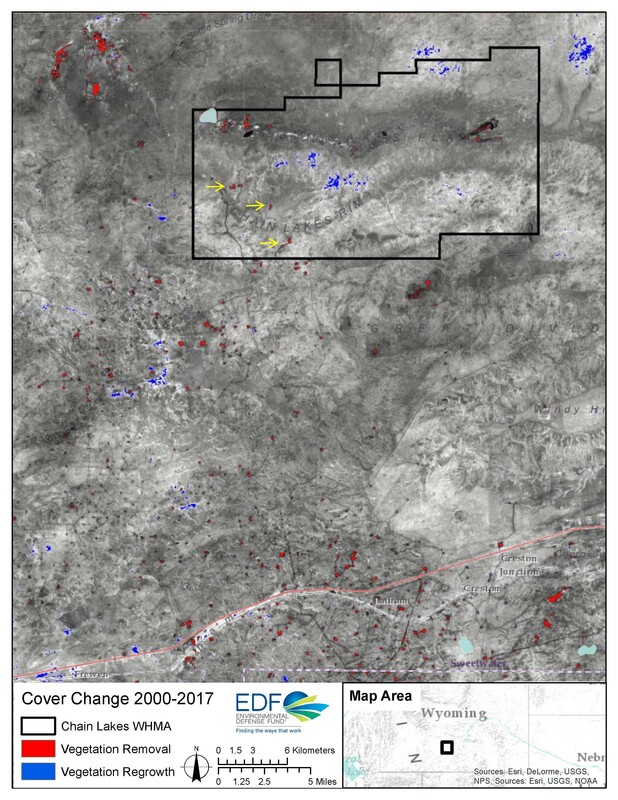 We have developed a process that leverages this extensive data to detect and monitor areas of change in the Red Desert – a process that could be widely applied to other critical geographies. This image shows an area of the eastern Red Desert just west of Rawlins, Wyoming. The black outline depicts the Chain Lakes Wildlife Habitat Management Area (WHMA). The red polygons show areas of development between 2000 and 2017. The blue polygons show areas of regrowth across the same time span. Energy development has been encroaching on the Chain Lakes WHMA for decades, and recently oil and gas development has occurred within the preserve. This development is highlighted by the yellow arrows in the southwestern region of Chain Lakes WHMA. In addition to tracking ongoing changes to the Red Desert landscape, we are working to assess the impacts of future energy development. Currently, environmental watchdogs have to sort through dense environmental filings that are submitted to government organizations as part of the National Environmental Protection Act (NEPA) and other permitting processes. NEPA documents are meant to determine whether a project poses threats to wildlife or water. Unfortunately, the process is long, variable, and relies heavily on descriptions of a site, making automated processing incredibly difficult. Putting this kind of information where it can be widely accessed and analyzed is critical in empowering stakeholders and supporting thoughtful planning. However, advances in computer processing are opening up exciting new areas for automation. My colleagues and I are leveraging a technique called Natural Language Processing, which uses artificial intelligence to process documents and extract complex information and themes, similar to how humans get information from reading. 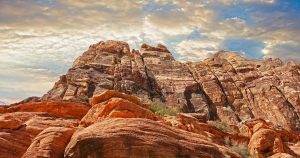 By combining this AI with a data scrubber, important environmental filings in the Red Desert and other at-risk regions can be automatically pulled from the web and processed to determine their impact to local communities and ecosystems. Once the data is processed, it can be incorporated into a web map or registry that would show stakeholders the impact of projects in their landscape before they have been approved. Putting this kind of information where it can be widely accessed and analyzed is critical in empowering stakeholders and supporting thoughtful planning that is needed for large landscapes to thrive. Wyoming is known for its abundant natural resources, but without understanding the extent and impact of energy development on the ground, we cannot effectively manage these resources. Technology can play a critical role in supporting conservation efforts across the globe. With these exciting new innovations we can show local communities, key industries, landowners, and state and federal policymakers the implications of large disturbances and development projects on vital landscapes that support people and wildlife. 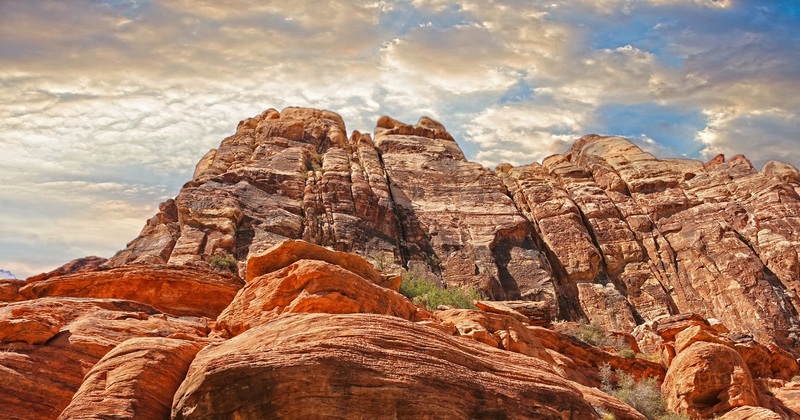 This entry was posted in ecosystems, Wildlife Protection and tagged energy, energy development, habitat, national parks, Natural Language Processing, oil, red desert, satellite imagery, wildlife, Wyoming. Bookmark the permalink. Both comments and trackbacks are currently closed. Wow extremely knowledgeable and well written!